This oceanfront villa with 5 bedrooms and accommodation for 10 is great for families or small dive groups. 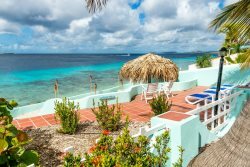 Use this centrally located villa to explore all the island activities or stay close to home for the best of Bonaire snorkel and diving.. There are five bedrooms each with a King and two Twins and a private bathroom. All windows are screened and secure to enjoy the ocean breezes, day and night, mosquito free. This oceanfront rental provides space where guests can gather or each can enjoy some privacy. The newly renovated (2017), open floor plan, kitchen and living area allows for great eat-in opportunities or gathering for evening chats. We are aiming to support the Bonaire eco-friendly philosophy with fully screened windows, water saving utilities and planned solar hot water. All rooms and living room have A/C but it’s rarely needed with full screens and ocean breezes. You’ll love the 360-degree panoramic view from the roof terrace or taking in the views from the seaside patio on the property. Private beach access just steps away where you can enjoy all water activities. Divers may wish to visit the famous Cliff site which is about 100 feet from your beach. Don’t forget about the villa’s own rinse tank, secure dive room and outside shower. You’ll also have access to a shared pool at the Hamlet Oasis Complex or a very short walk to visit the two nearby dive shops or a great oceanfront restaurant. For more information and pictures visit our Facebook page. We're a group of scuba divers who have been vacationing and diving together for many years. Hamlet Villa #9 is by far the best property we've ever stayed at. Not only can you literally step from your porch into the gorgeous turquoise waters of the Caribbean, but there's one of the best dive sites Bonaire has to offer (The Cliff) right in front of the house! So, each evening after our night dive, we were able to get out of the water, relax with a cocktail or two and throw something on the barbecue for dinner - total bliss. The house is very well laid out with 5 bedrooms that can be arranged as either a king-sized or two twin beds; each bedroom has its own bathroom. The living area is great as well, with a huge open kitchen that offers all the amenities. The highlight of the property is the outdoor space that is simply gorgeous, with chaise-lounges, easy chairs, a pergola with table and chairs, outdoor shower, huge table on the covered terrace in front of the kitchen that easily seats 10 people, etc. Imagine sitting in a lounge chair, looking at Klein Bonaire and watching the sun set every evening right from your back yard! For divers there is a very handy rinse station and an equipment room that even has a washing machine. The property is very clean and tastefully furnished. Rob and Zwanet were super friendly and welcoming hosts. There is simply nothing negative to say about this property. We look forward to staying here again on our next visit to Bonaire!